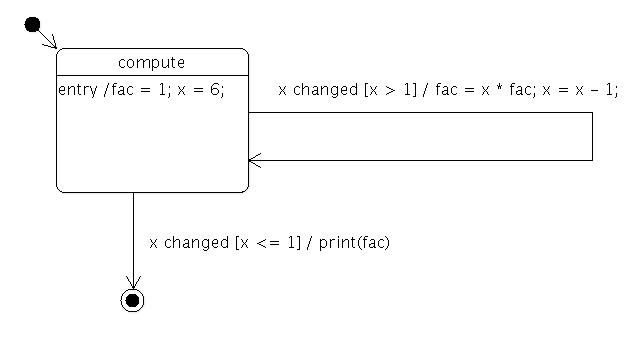 In other words, the state machine calculates the factorial of 6 and prints the result. The Factorial class is used to hold the data of the computation, x and fac. It also provides a signal that's emitted whenever the value of x changes. The FactorialLoopTransition class implements the guard (x > 1) and calculations (fac = x * fac; x = x - 1) of the factorial loop. The FactorialDoneTransition class implements the guard (x <= 1) that terminates the factorial computation. It also prints the final result to standard output. The application's main() function first creates the application object, a Factorial object and a state machine. The compute state is created, and the initial values of x and fac are defined. A FactorialLoopTransition object is created and added to the state. A final state, done, is created, and a FactorialDoneTransition object is created with done as its target state. The transition is then added to the compute state. The machine's initial state is set to be the compute state. We connect the QStateMachine::finished() signal to the QCoreApplication::quit() slot, so the application will quit when the state machine's work is done. Finally, the state machine is started, and the application's event loop is entered.